Congrats on your blogiversary!! Hobby Lobby is my favorite store too!! 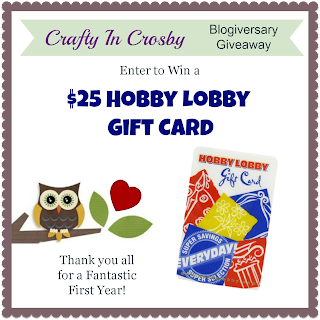 If I won the gift card I would enjoy a fun afternoon browsing the store and leave with the goods for my next craft project :) thanks for hosting the giveaway! Hi I came by early but was in a hurry and didn't leave a comment. I loved your light redo! Isn't it amazing the transformations we can make! Thanks for sharing. And congrats on your anniversary. I am going to enter to win. Thanks for coming by tonight and seeing my quilt progress. I would look for something springy for the house. I love hobby lobby. Congrats on the 1 year anniversary! I know how much work that is:) Thanks for the sweet comment you left on my blog. Can't wait to see what you do with the cabinet door you got! Happy Blogaversary! As my niece had a baby recently I would buy something to make as a gift; some fleece to make a hat and booties, a picture frame and some scrapbook stickers to decorate it. Happy 1st Blogiversary! With a Hobby Lobby gift certificate, I would purchase some organizing containers for my ever groowwingg supply of supplies! I'm a papercrafter so if I won the gift card I would buy card making supplies...stamps, paper, embellishments, adhesives. And since I am a thrifty papercrafter, I would wait until the supplies are on 50% off sale so I could get $50 worth of supplies with the gift card! Love Hobby Lobby! We are going on a road trip soon, so I would probably buy something fun for the kids to do in the car. I would probably buy (more) spray paint, some canvases and vinyl! Or fabric!! So many choices!! I need a shadow box for a Mardi Gras mask!